"Yours is a first-rate operation--impressively experienced and professional. Thanks!" "Price started out a little high but the rep allowed for me, the homeowner to choose to do some of the preliminary work , such as..."
Price started out a little high but the rep allowed for me, the homeowner to choose to do some of the preliminary work , such as demolition of existing walls and worked with me on the upgrades to make pricing reasonable. The sales representative from Quality 1st Basement Systems was very knowledgeable. We felt comfortable after our meeting. Prior to this we had thought about this project for 4 or 5 years. Each time I spoke with someone in the office they were friendly and helpful. I found Quality 1st Basement Systems on the internet and we selected them after receiving other estimates. Their price seemed fair and I felt I got an honest assesment. I first approached Quality 1st Basement Systems because my basement was damp and moldy. My basement had a pit, but no sump pump, and it was getting hard to take care of. When I called the office, the staff answered all of my questions, and explained the time and the details of the job. The saleswomen Jessica also had a good presentation, and took the time to meet with me a few times before the work began. When it came time for the installation, the team was great! I was especially impressed with Juan Garcia and his exceptional and thorough work that he provided. Overall Quality 1st Basement Systems was a joy to work with, and I am very satisfied with the whole process. I was referred to Quality 1st Basement Systems and am very satisified with the job done. The salesman treated my wife professionally and we trusted our salesman, Michael Jersey. 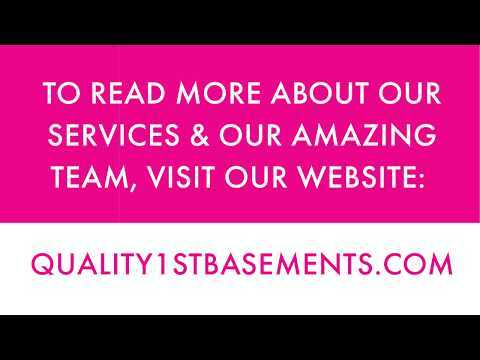 We picked Quality 1st Basement Systems because of the company information available to us, including a helpful video presentation. We had issues with some water getting into our basement. So we went out and got a few companies to look at our situation. After meeting with your design specialist, John Schweitzer, we felt confident that your company was the optimal choice in selecting a waterproofing system. John did a thorough analysis of our basement and put together a comprehensive plan that would address the problem. Other companies did a basic analysis and didn’t provide much comfort that they could get the job done effectively. John sat down with us, answered our questions and listened to our concerns during our meeting with him. He was informative and knowledgeable of the product you sell. Other companies out there offer similar products, not waterguard, but overall a French drain type system. We could have gone with one of the other groups, but Quality 1st’s customer service level led us to believe that they’d be the right company to do the job. Juan Garcia and his crew did the job a few weeks later and put the system in place quickly. Juan was very professional and answered our questions during the course of the project. He and his team were very hard workers and must be assets to your company. After the completion of the project, John was available to answer follow up questions that we had about the basement system your company installed and he followed up with us to be sure it was doing what it is supposed to do. We’ve been leak free over the past two months. Should we know others who might need your product in the future, we will gladly recommend your company. I had moved into a new house and had water in the basement. My friend recommended calling Quality 1st Basement Systems. I was confident with their presentation and ancillary documents, they were very professional. I am very satisfied with my waterproof basement. I want to thank first Bob Cherry, the general manager, and Phil Matthews, the system planner, for working out a solution to our unique issue. This speaks to the integrity of the Tom Romans company. Secondly, the work crew did an amazing job. The foreman, Juan, sized up the situation quickly and had the men working quickly and efficiently. Within two hours, the crawlspace was cleaned out, all debris removed, the Super Sump installed and new discharge line installed. A note about that — the crew had to take up part of a paved walkway and dig up a mulch bed. When they were finished, that area actually looked neater than when they started! You could not tell any digging had been done at all. That night, we had a storm, a lot of rain in a very short period. The pump and discharge line worked perfectly. We will of course call Tom Romans when the budget allows for the full crawlspace system to be done. Specialist Dan McNally was very good and explained our situation. He provided clear understanding of what needed to be done. Juan has a tremendous understanding of the industry having spent 8 years installing basement and crawl space waterproofing systems. He bring focused, intelligent approach to each job he is invovled with and is a true professional. Waterproofing a Basement in Pompton Plains, NJ. Wet Flemington Basement Rescued with WaterGuard. Cherry Hill homeowner had multiple cracks in his basement foundation and basement flooding. Quality 1st completed the foundation repair and fixed the cracks in the wall, waterproofed the basement using the WaterGuard draining system, then refinished the basement using ThermalDry Wall System. ThermalDry not only increases energy savings in the home as its foil face reflects heat back into the basement, but is made of inorganic materials which means it will not grow mold and will keep water out! A basement in Vincentown, NJ needed new flooring and carpeting. Quality 1st Basement Systems installed ThermalDry basement floor panels in the carpet color charcoal. As a leading basement finishing contractor, we have the best products that can handle the harsh environments of basements. Now, this basement looks amazing and has comfortable flooring! A homeowner in Little Egg Harbor, NJ had signs of mold in their crawl space and needed a new vapor barrier. Quality 1st system design specialist inspected the crawl space and noticed that the crawl space needed to be encapsulated. A new vapor barrier system, CleanSpace was installed in the crawl space. This vapor barrier system is durable, bright white liner that goes on the walls and floors preventing humidity from passing through. This system is mold resistant and will prevent against rips and tears. A resident living in Princeton, NJ was experiencing basement flooding during rain storms. A System Design Specialist noticed that the water was seeping in through natural spacing between the foundation walls and footing. The installation team installed a WaterGuard system around the perimeter of the basement. WaterGuard flange spacers leave a neat, finished look and will catch water, dirt, and debris from the basement floor and prevent flooding for this homeowner! Quality 1st Basement Systems waterproofed this Princeton, NJ basement due to frequent basement flooding. The water in the basement was so severe that the bottom half of sheetrock had to be removed. Quality 1st Basement Systems replaced it with EverLast waterproof basement wall panels. The basement is now safe and dry! Quality 1st Basement Systems patched up this leaky crack in the basement wall with FlexiSpan. FlexiSpan is a flexible seal for cracked walls that keeps moisture out of the home. It stays bonded with the wall permanently for a long-lasting solution. Now this Princeton, NJ basement is dry and safer. Quality 1st Basements received a call from a homeowner in Princeton, NJ about sagging crawl space beams. The sagging beams had caused gaps up to a full inch between the floor and the bottom of the door in each bedroom. Foreman, Juan Garcia, and his team installed SmartJack Stabilizers. Each SmartJack is adjustable to lift the failing floor joists and beams that are causing the floor to settle. This crawl space had standing water after a bad storm and the new homeowner wanted to get this problem resolved right away since he just purchased the home and didn't want future damage to the space. Quality 1st Basement Systems was able to completely waterproof this Skillman crawl space with Cleanspace, Drainage Matting, Silver Glo, Smart Pump, SaniDry Dehumidifier, and IceGuard. Any Future water leaks will be directed straight the the SmartPump and Pump out away from the home. The IceGuard will allow the water to still have a proper exit even in the winter when the pipe freezes. This homeowner can now enjoy his new homer rain or shine without having to worry about a leaking crawl space. The owner of this West Creek, NJ basement needed a more powerful sump pump to keep the area dry. Quality 1st Basement Systems installed a SuperSump sump pump, which is reliable and has an airtight seal! To prevent water from coming into the crawl space, Quality 1st Basement Systems installed an EverLast crawl space door at this Manchester Township residence. Quality 1st Basement Systems renovated this unfinished basement in Barnegat, NJ with brand new flooring and walls. Neshanic Station homeowner had a dirt floor crawl space. Dirt crawl spaces can present many problems for homeowners and should be treated. The CleanSpace Crawl Space Vapor Barrier system seals off this crawl space from the dirt and water vapor that enters the crawl space, which eventually would have traveled to other parts of the home. The CleanSpace liner ensures that only clean, dry air is in this crawl space! Quality 1st Basement Systems replaced this outdated sump pump with a TripleSafe sump pump. The TripleSafe sump pump is reilable and has a battery back-up pump in case of emergencies. Now this Hightstown, NJ basement has a powerful sump pump to keep it dry. Our Restoration EverLast Wall Panel System is the perfect solution for wet and damaged dry wall. Water stands no chance against this waterproof and mold resistant panel. With built- in insulation, these panels not only create a warmer environment in the basement but also give it a brighter look as well. Protect your investment, get EverLast Wall Panels! This home flooded due to Hurricane Sandy and needed a new crawl space vapor barrier to protect the home. Quality 1st Basement Systems installed CleanSpace to protect the crawl space from the cold concrete. Our CleanSpace crawl space encapsulation system keeps water, moisture, and critters out of this crawl space. 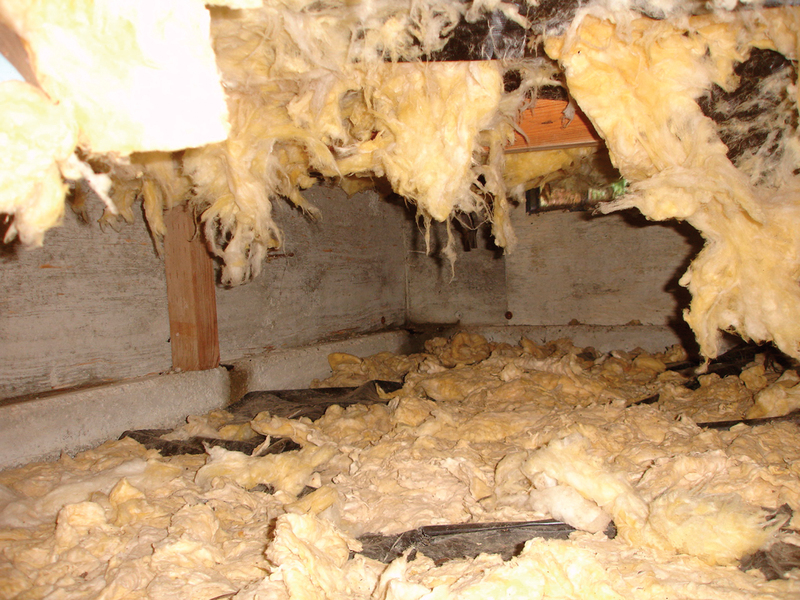 To improve the heating and cooling costs of the home, SilverGlo crawl space insulation was installed to insulate the crawl space. This homeowner is now able to enjoy a much healthier home! This Forked River home had water coming in through the crawl space. The homeowner called Quality 1st Basement Systems to waterproof their house so they could safely sell it. Quality 1st Basement Systems installed CleanSpace vapor barrier. CleanSpace transforms damp crawl spaces by creating a barrier between the crawl space and moisture. It is made out of durable, thick plastic which locks out water and keeps any crawl space safe and dry. Now this house is ready to be sold with its newly dry, mold resistent basement. Quality 1st Basement Systems installed CleanSpace vapor barrier in this Jackson, New Jersey crawl space. CleanSpace vapor barrier not only keeps the crawl space much cleaner and tidier, it protects the wooden crawl space supports from moisture and rot. This sealed crawl space has lowered moisture and humidity levels. A family in Raritan, NJ suffered through water in their basement for years, but Quality 1st Basement Systems came to the rescue! To keep the basement dry, we installed the WaterGuard basement waterproofing system which does not clog, drains to the sump pump, and will not cause damage to the foundation. Quality 1st also installed CleanSpace wall covering which will stop water vapor from coming through the walls and brightens the basement!